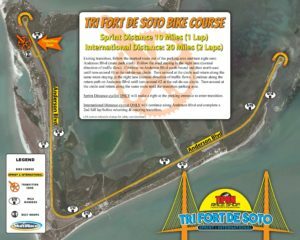 The event company Multirace, holds numerous running and Florida triathlon events, and recently has planned an event in Habana, Cuba. 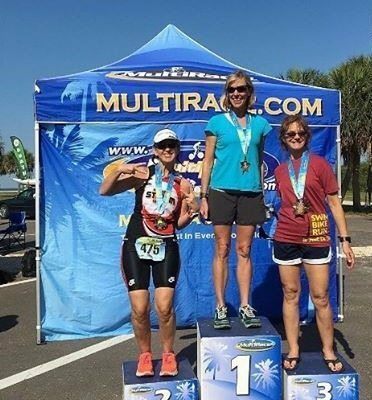 The Multirace Florida triathlon events, I have competed in, have not been hugely populated, but yet large enough to feel that there was some competition. This third race in the FD3 Florida Triathlon series was no exception. 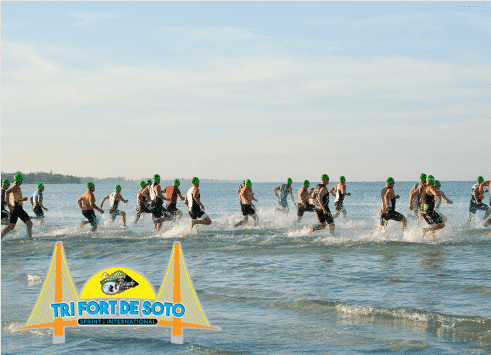 The race is held at Fort DeSoto Park (hence the FD in the title) in Pinellas County, Florida, therefore it holds stunning views of white sand beaches and beautiful sunrises. The online and offline registration is very well-organized. Tables are set-up with the two volunteers checking names, identification and handling bibs while the second station hands out swag and t-shirts. Concluding the process is body marking and chip retrieval. Everything moves pretty smooth when the athletes are composed and listening. There are bike racks at the entrance to the registration area, but when athlete’s decide not utilize them, the space becomes a little crowded causing some slow-down in the process. shore. Depending on the tide the water is estimated anywhere from three to fifteen feet deep across the total swim. Along with plenty of extra safety from paddle-boarders and kayakers, this really helps in the case of any first-time open water or nervous swimmers. department volunteers spread throughout the closed course for safety purposes. to an out-and-back course on an asphalt paved trail. When they reach the turnaround of the out-and-back, they are greeted with the actual Fort DeSoto for which the park is named. Most noteworthy for the first-timer is this humbling sight used during the Spanish-American War in 1900. Three aid stations are on the run loop; at the entrance, mile 1 and mile 1.5. In addition, the mile 1 aid station then doubles as also the 2.5 mile aid station. Even with the abundance of water and sports drinks on the course, the dates of the race are in the three hottest and humid months of the year in Tampa. At temps averaging over 90 degrees and humidity over 60%, the wide open run course becomes tough on a lot of runners that are susceptible to the heat. All three events utilize a transition area built by Multirace in the parking lot North Beach. 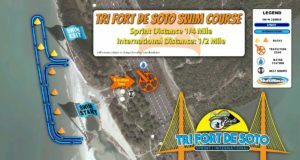 The Swim and Bike entry are on the north side while the bike and run exit are on the south. It is the basic transition area with bars to hang your bike. Luckily the race is not huge, so there is plenty of room to set up without the risk of equipment being trampled or moved. Finally, the finish line has plenty of spectators, photographers while the energetic announcer entertains. He always gives his best attempt to give everyone recognition as they cross the finish line. 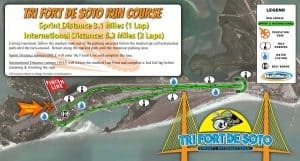 Run course has no shade (see first point). This year I have completed two of the three Florida Triathlons and I really enjoyed them. They are flat, fun and the event staff really take care of the athletes. As a result, safety and an enjoyable experience seem to be at the top of Multirace’s priority list.